For the winter-loving family that owns this chalet at Devil's Glen Ski Resort, a getaway where everyone can gather year round was important. The chalet has been in the family many years. In fact, the original building was constructed by the current owner's father. 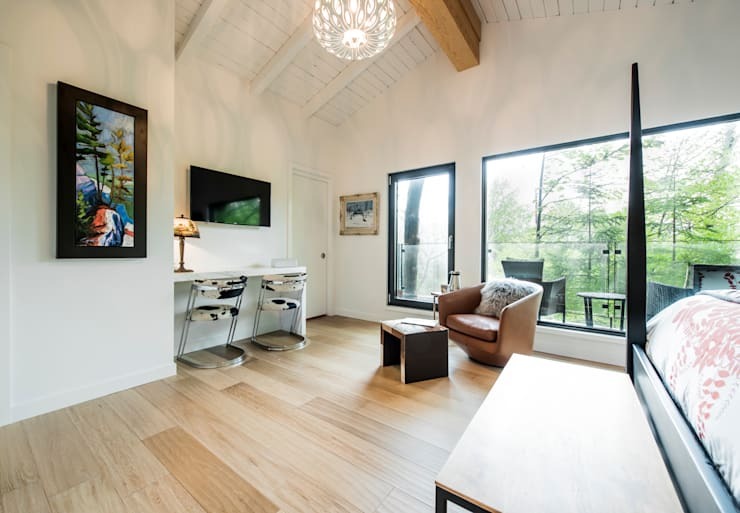 When it came time to update and expand the chalet, the family and their architects, BLDG Workshop Inc. based in Toronto, wanted to be true to the original structure and the unique mountainside site. The result of the renovation is a modern structure that blends old and new and has plenty of space for current and future generations. 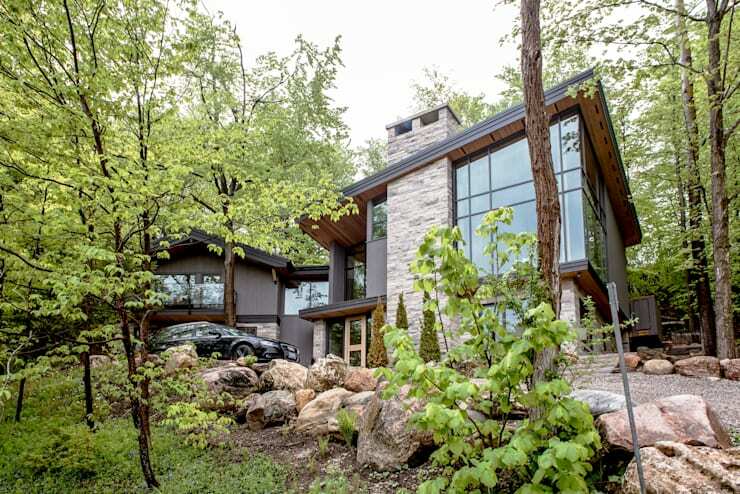 The new modern-style chalet fits in perfectly with its wooded surroundings. Stone cladding on the foundation and the chimney make it feel like the house grew out of the mountain itself. Wood soffits echo the trees around the house. Grey vertical siding on both the original structure and the new addition lets the building recede into the lot, rather than competing with the natural environment around it. The exterior finishes are consistent between the old and new parts of the home, unifying the two sections. Gently pitched roofs and large windows further tie the home together. The lower level entryway sets the tone for the interior of the home. The glass door and large windows let natural light flow into the foyer. 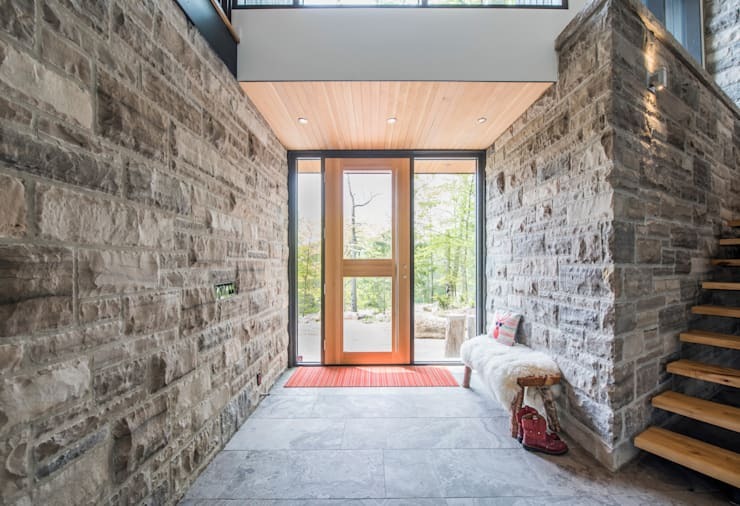 Wood on the ceiling, stairs and door references the trees that surround the home and is a warm, organic element against the hard stone used on the walls and floors. The stone is both an aesthetic and practical choice. Hard-wearing tile floors can take a beating--standing up to muddy hiking boots or snowy skit boots. The stone walls are equally durable and won't show scuffs or dent like drywall would. Ascend into the upper level of the home, and it's obvious that this is a gathering place for large groups. 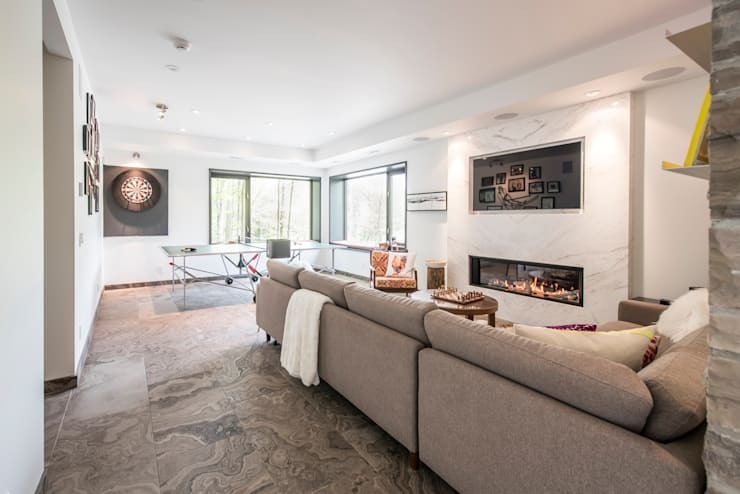 The art on the wall showcases the family's favourite activity front and centre: two canvases depict the skiing that draws everyone back to the chalet every year. Once they arrive, the main living area provides plenty of room for everyone to be together. The large open great room includes dining, kitchen, living and lounging. The large dining table offers plenty of space to pull up additional chairs, and a bench on one side offers even more flexibility to squeeze in as many people as possible. 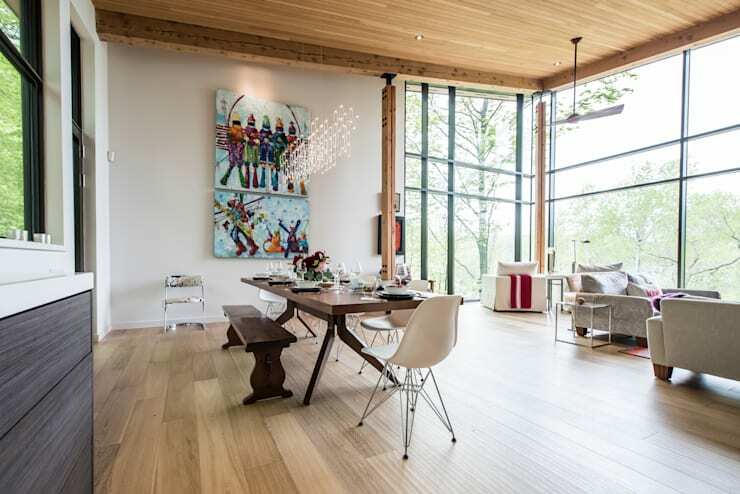 The designers created an eclectic mix of styles through the traditional curved legs on the bench, the angular mid-century-modern table, iconic Eiffel chairs and an airy modern chandelier floating overhead. The effect is a casual, collected and highly personal aesthetic. The adjacent kitchen presides over the main floor, serving truly as the heart of the home. After a day outside, a hot meal cooking in the kitchen and a warm fire burning in the hearth draw everyone together. The huge island offers a slight division between the living and kitchen and provides abundant space for everyone to prepare the food together. The same stone that was used on the outside repeats on the inside, covering the fireplace from floor to ceiling. Thanks to large windows on either side, the fireplace does not overwhelm the space. The new section of the chalet employs a clean modern aesthetic. Black framed windows overlook the woods. Flat front cabinets in a grey finish echo the tones of the stone and exterior siding. 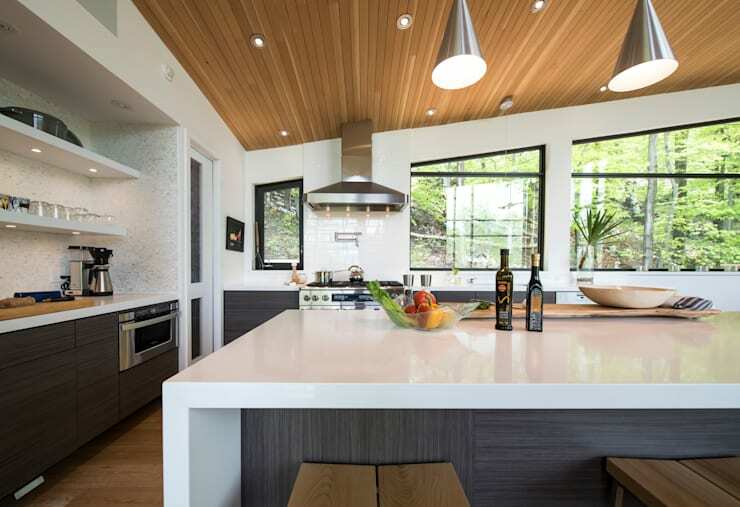 Wood paneling on the ceiling offsets the white walls and stainless steel appliances, adding warmth and visual interest. In the kitchen the dark grey cabinets anchor the room. 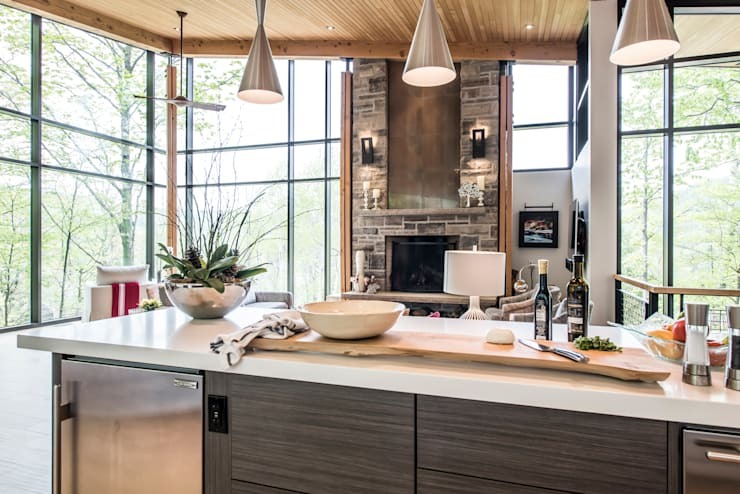 The designers elected to skip upper cabinets in favour of large windows and open shelving. White counters are used throughout the kitchen both around the perimeter and on the island. The waterfall edge on the island is a trendy modern accent. Cozy seating abounds in the living room where large couches are ranged around the fireplace. Soft pillows and warm throws encourage relaxing. The family stuck with the grey palette for the upholstery, adding accents with a wood coffee table and a bright abstract patterned rug. The soaring ceiling enhances the spacious feel of the generous main floor. The BLDG Workshop team left the beams that support the ceiling exposed, creating a rustic accent within the modern design. 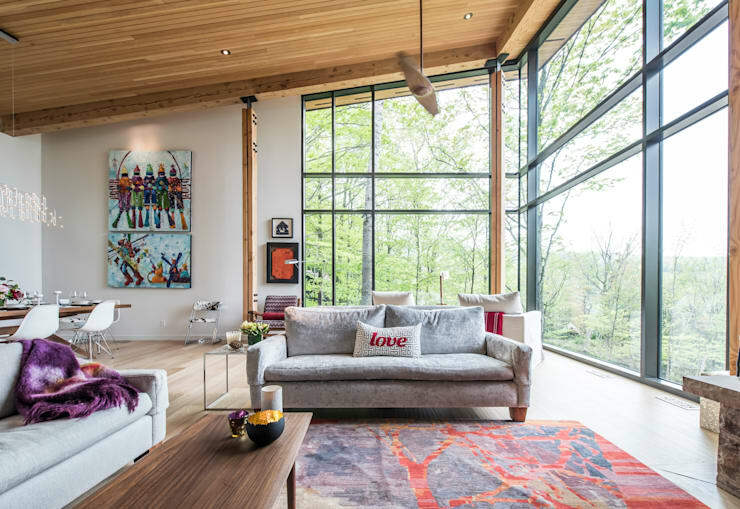 The beams frame the large windows that overlook the forest and mountains. When they're not relaxing in front of the fire, the family has the option of taking in the expansive view outside from these two chairs. 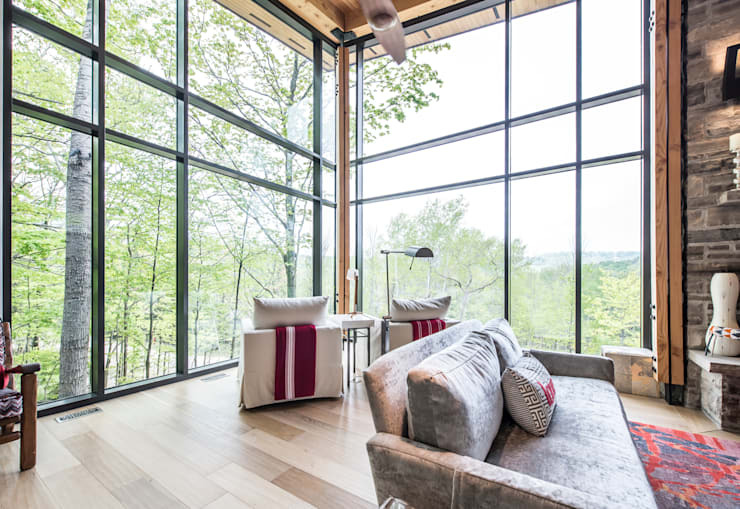 Set in the corner where the two walls of windows meet, these comfy armchairs overlook the ski hills and offer the best vantage point to sit and savour the forest and sky. See a simple home with an extraordinary view. The original chalet received a substantial makeover in the renovation. Walls were opened up, new flooring was laid that was consistent with that of the new addition, dark framed windows were installed. This large space became a generous bedroom. The vaulted ceiling has a similar feel to the one in the great room. Here, the original planks were painted white, which adds a fresh airy feeling while still letting the rustic character of the wood to shine. 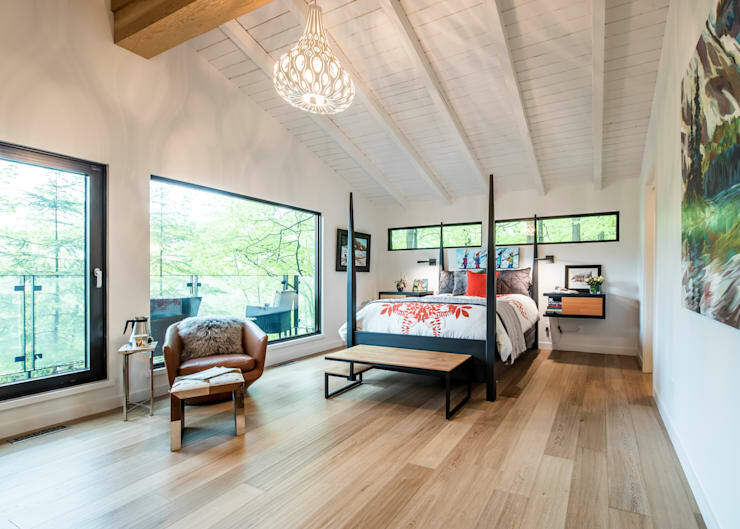 Modern furniture choices, like the updated four poster bed, floating nightstands and clean-lined bench, are in keeping with the aesthetic of the newly renovated space. On the other side of the bedroom, a small desk offers a space to work or enjoy morning coffee. A cognac leather tub chair is an equally inviting spot to take in the view. Set high amongst the trees, this bedroom is feels like it is part of the forest. In warm weather, the home owners can access the private balcony that overlooks the front of the property. Throughout the house, the designers carefully considered every choice to ensure that it was both attractive and practical. 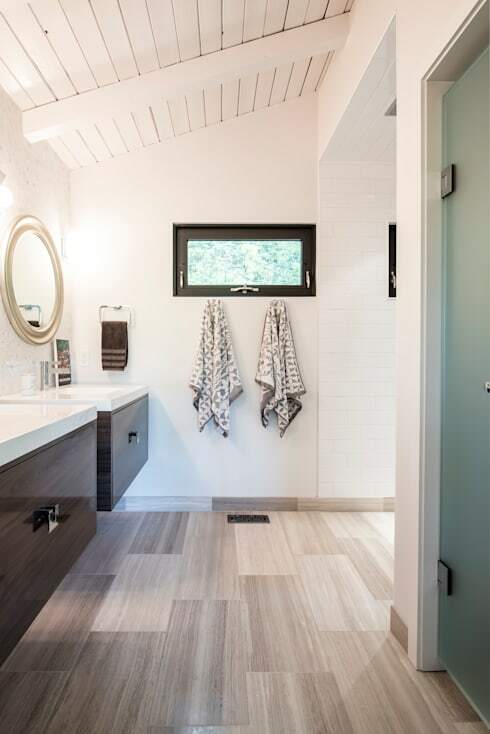 In this bathroom, floating vanities in a beautiful dark wood are topped with sleek white counters. Large drawers provide ample storage, while the dark finish is a striking feature. Hooks are a simple solution for towel storage. The wood-look tile used on the floor was cut into thin bands to serve as baseboards around the base of the walls. In the shower area, white subway tile runs all the way to the ceiling, providing a durable, waterproof backdrop. The grey tones, black window frames and painted plank ceiling ensure consistency in design throughout the house. See 10 tantalizing tile trends for your home. As this chalet is a gathering space, lots of space for everyone to sleep was important. Multiple bedrooms on the lower level ensure that everyone has a spot to recharge after a day outside. In contrast to the wood floor used upstairs, the lower level features large tiles. The strong veining in the stone creates energy and movement, while the neutral colours are in keeping with the rest of the home. 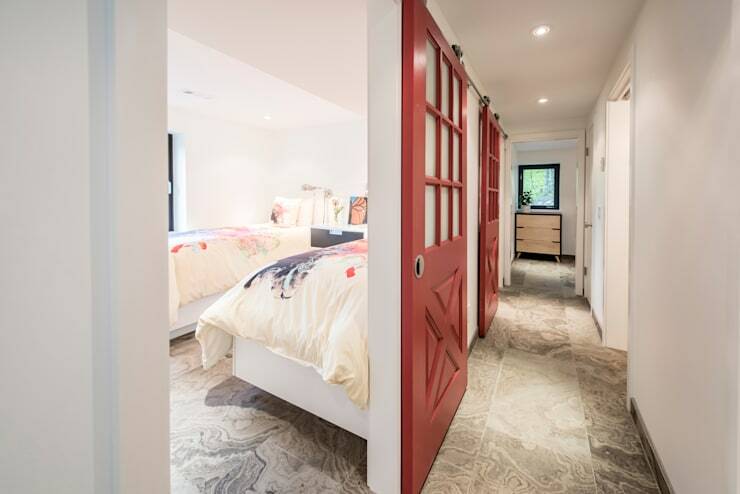 Sliding barn doors in a bright barn red are a fun accent in the hallway. The doors take up less space than swinging options and their traditional style is a contrast to the clean modern look seen elsewhere. See 15 different interior door styles to suit all tastes. 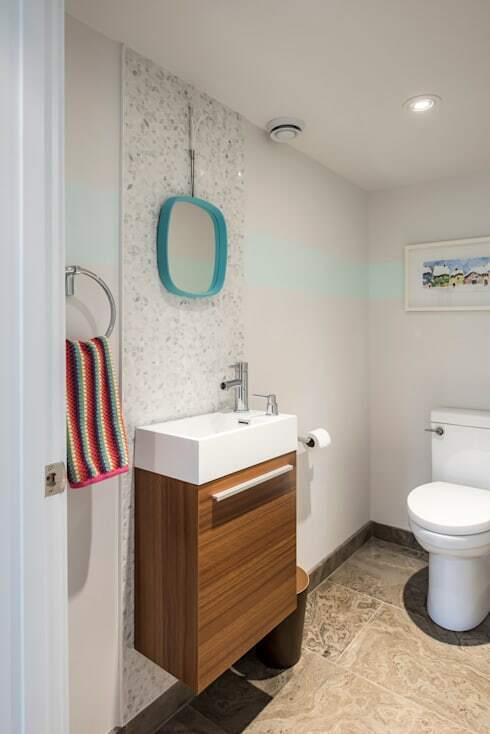 The functional and beautiful design continues in this bathroom. The floating vanity may be small on size, but it's big on style thanks to the strong wood grain and mosaic tile backsplash that runs all the way to the ceiling. While the main fixtures are all neutral, pops of colour show that this family--and their home--is all about fun. The turquoise frame of the suspended mirror, the kaleidescope of stripes on the towel and the subtle aqua band painted on the wall are all light-hearted accents--and ones that can easily be changed with the season. See 8 tricks to make your dark dingy bathroom brighter. A secondary hangout area on the lower level shows that this is a home built for togetherness. Another large room gives lots of space for people to gather. They can settle into the large sectional couch and watch a movie on the big screen TV. Or they can challenge each other to a game of pingpong or darts. A gallery wall celebrates the many generations that have enjoyed this chalet--and continue to be drawn to this rejuvenated family getaway.